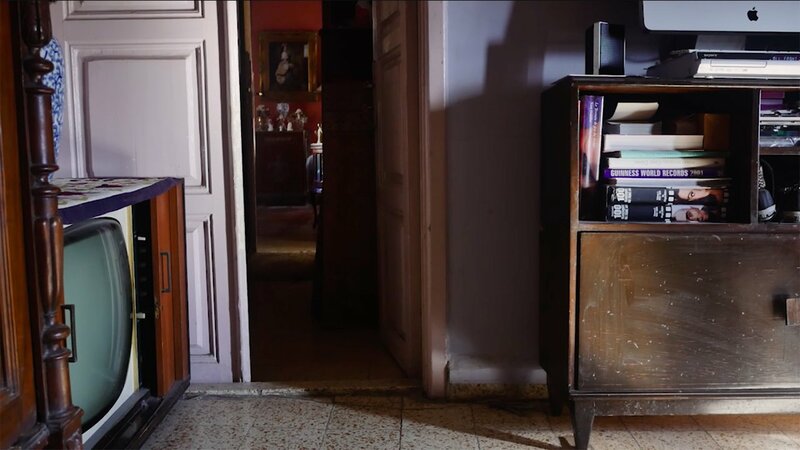 Towner Gallery, Eastbourne, on Thurs 2 Nov.
Anthony Chidiac’s Room For A Man is deeply personal documentary that examines one man’s sense of place and how the interior and exterior borders of our lives shape where we call home. The film opens with an expansive panoramic shot of the mountains of La Rioja, Argentina the vastness of which presents both a sense of freedom and loneliness while a female narrator tenderly gives voice to the Chidiac’s fears and desires. Chidiac is a Lebanese director and much of the film takes place within his home that he shares with his mother. Many of the shots inside the home are framed by doors and windows which invokes a claustrophobia indicative of the loneliness Chidiac feels living there. A home without a family is simply a building and we learn quickly that Chidiac’s mother disapproves of his homosexuality that she sees as a weakness and a failure. His father who does not appear until later had no presence in his life, something that his mother attributes Chidiac’s sexuality too. Chidiac recounts his family’s history, which is one of former glory and power the vestiges of which his mother and uncle still cling too. He asks his uncle what he thinks of him while interviewing him to which he replies: ‘stay out of the frame of this glorious family image.’ It’s a powerful scene and one that highlights the gulf between loving a member of ones family and loving the family as a historical object. The titular room is being renovated by Syrian laborers and a significant portion of the film focuses on Chidiac’s interaction with these men and boys. One of these men in particular – Mohamad – expresses many of the similar feelings of isolation that Chidiac experiences. Mohamad has fled military service in Syria and instead found himself working in Lebanon away from friends and family. Though both men’s loneliness has different routes they both dream of escape and in one poignant scene draw a map of Europe on a wall. Chidiac’s mother is unhappy with Syrians in her home, she feels threatened by them, and we see that her dislike of refugees and homosexuals is routed in a fear of the other. Both refugees and homosexuals are seen as invaders of space, be it the physical home and body or the constructed ideas of nation and masculinity. Towards the end of the film Chidiac’s father returns seemingly unexpectedly and under the guise of helping Chidiac apply for citizenship. Chidiac’s filming of his father is tense and at times uncomfortable, there is an almost interrogatory aspect to it and Chidiac’s father seems aware of this asking at one point: ‘am I outside the family?’ There is no answer and later this fraught relationship culminates in his father’s admission that despite travelling his whole life he never found happiness. Like most journeys the film ends where it begins with stunning shots of La Rioja taken from a vehicle as Chidiac espouses his desire to leave and live somewhere else. There is fatalism to this repetition and as a viewer we are left to wonder where ‘somewhere else’ is and whether it exists at all. Anthony Chidiac’s Room For A Man comes to Brighton’s Fabrica Gallery on Thurs 1 Nov and Eastbourne’s Towner Gallery on Thurs 2 Nov 2018. Next articleWhich are your favourite Brighton & Hove icons?